WALPOLE, MA -- The Eastern Hockey League put together the first showcase of the season this past weekend at Rodman Arena. There were over 50 programs on hand to watch all 16 teams in action over the course of 2 days. "This was a great start to the showcase series for the EHL" said Wizards head coach and general manager Freddy Meyer. "After every game there were college coaches lined up outside the locker rooms waiting to talk with the players. This is why we are all here." On Friday, the Wizards matched up against the Central Division's 1st place Connecticut Roughriders for the first time this season. The Wizards entered the game with a 3-game wining streak on the line, as the team had got back to .500 after starting the season 1-4-0. Michael Major got the boys on the board early, just 3:21 into the 1st half. However, the Roughriders tallied the next 3 goals and won by a score of 3-2. Roughriders goalie Jeremy Thelven was a tough to beat, stopping 31 shots in the victory. Matt Fuller, who was announced to play for the EHL All-Star team on Saturday against Umass Boston, had a pair of assists in the loss. Shifting gears to Saturday afternoon, the Wizards went for the season sweep of the New York Applecore. Devin Panzeca put the Wizards on the board in the first half as Matt Gulack collected his first point as a Wizard with an assist on the goal. The Applecore would get 1 back in the 2nd half to force a 5-minute overtime period. However, just 1:45 into the extra frame, Pazeca put home his 2nd goal of the game on the power play to beat the Applecore by a final of 2-1. In net, Jordan White had a solid outing while stopping 29 of the 30 shots he faced. Up next for the Wizards is a big divisional match-up against the 8-2-0 Walpole Express on Friday at 1pm. 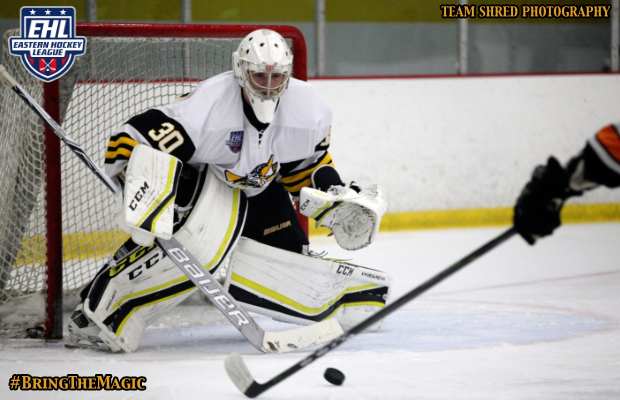 Wizards #24 Matt Fuller has been named to the EHL All-Star Team for a exhibition game this weekend against UMass Boston. The defensemen has played in all 10 games this season, tallying 5 assists along the way. His 5 assists put him 2nd on the team in that category. On Saturday, October 21st, the EHL All-Stars will travel to the campus of Umass Boston to face-off with the Division III Beacons. The EHL roster is comprised of at least 1 player from all 16 teams in the league, and the puck drop at the Clark Athletic Center is scheduled for 4:00pm. This will mark the first time that an EHL team has ever taken on a NCAA program.